To begin voice-controlled shopping, users must say "Hey Google, talk to Walmart." Then, they can ask the virtual assistant to add items to their Walmart Grocery cart, and check out. Walmart Voice Order will get better at identifying the specific items you want the more you use it. For example, the feature should be able to identify the type of milk you want based on previous orders. But it's unclear how many consumers actually want to buy anything using their voices—according to a report, only 2% of those who own Alexa-enabled devices have ever placed an order using the assistant. In its latest attempts to battle Amazon, Walmart teamed up with another tech giant to introduce a new way for its customers to buy groceries. According to a blog post by Walmart's senior vice president of digital operations, Tom Ward, Walmart will now let those with Google Assistant devices buy groceries just by using their voices. Dubbed Walmart Voice Order, the feature will roll out over the next few weeks to those with Google Home devices along with other Google Assistant-enabled devices, including Android smartphones and iPhones. To begin voice-controlled shopping, users must say "Hey Google, talk to Walmart." Then, they can ask the virtual assistant to add items to their Walmart Grocery cart, and eventually, check out. Like most virtual assistant features, Walmart Voice Order will get better at identifying the specific items you want the more you use it. 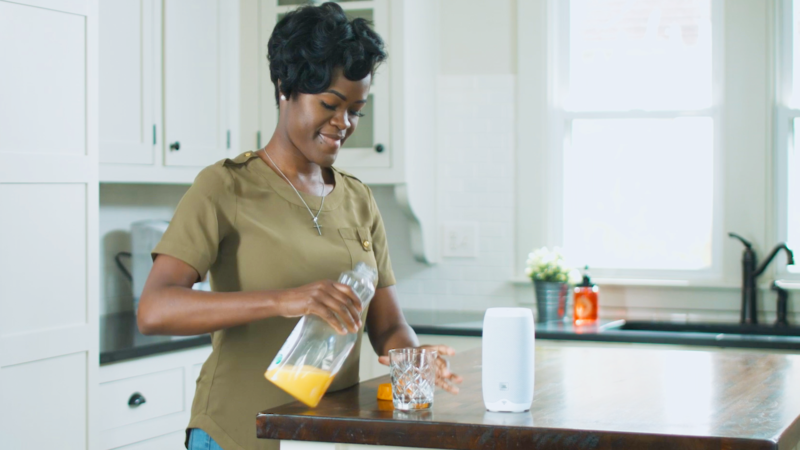 For example, the feature should be able to identify the type of milk you want based on previous orders.Google's Assistant is available on more than just Google-made devices. Those with Google Home Hubs can ask Walmart Voice Order to do their shopping just as easily as those with Android smartphones or iPhones with the proper software installed. Ward writes that Walmart is "kicking off the work with Google," but it plans to add other platforms into the mix in the future. That could mean Walmart wants the feature to eventually work with Apple's Siri. This is just the latest attempt by Walmart to get on the same level as Amazon in terms of online shopping, particularly digital grocery shopping. While Google has more Assistant-enabled devices in the world thanks to its Android smartphones, Amazon continues to dominate the smart speaker market with the millions of Alexa-enabled devices it has sold. Amazon has also allowed users to shop using Alexa voice commands for quite some time. However, ordering household items like toilet paper and detergent is different from ordering perishables like milk. It's unclear how receptive users will be to placing digital grocery orders with their voices for perishable items. In general, online grocery shopping hasn't swamped the market yet as many still prefer to go to a physical store to pick out the items they want (which is one reason why Amazon's $13.7-billion acquisition of Whole Foods back in 2017 was so important for the online retail giant).But it's also unclear how many consumers actually want to buy anything using their voices—according to a report by The Information, only 2 percent of those who own Alexa-enabled devices have ever placed an order using the assistant. Amazon publicly disagreed with the findings of that report.